Absorption: The property that causes paper to take up liquids or vapors in contact with it. Acid free paper: Paper manufactured to a neutral pH reading (7). Used for fine art prints, limited edition printing, scrapbooking and other applications. Anti-offset spray: In printing, a material (usually dry starch particles) sprayed on to the wet ink film surface to prevent set-off. Antique finish: A very rough and random uncoated paper finish created by the manufacturing process. The term can also serve as a prefix to other finishes, implying a rougher than usual finish, such as “antique vellum”. Art work: Original materials, including the illustrations, lettering, charts, color blocks, etc. which are to be reproduced in a printed piece. Base paper/stock: Paper made for further converting by coating, laminating, etc. Basic size: A customary standard sheet size that is used to determine the basis weight for 500 sheets of paper. Also known as standard size, parent size or basis size. Basis weight: The basis weight of paper is the designated fixed weight of 500 sheets, measured in pounds, in that paper’s basic sheet size. Blanket: A fabric coated with rubber or other synthetic material which is clamped around the blanket cylinder and which transfers the ink from the press plate to the paper. Blanket-to-blanket press: An offset lithographic perfecting press that has no impression cylinders; during printing, the blanket for one side acts as the impression cylinder for the other side and vice versa. Also called perfecting press unit. Bleed: 1) An illustration that extends to one or more of the edges of a printed piece; bleed illustrations are usually printed 1/8″ beyond the planned trim edge(s). 2) Term applied to a lithographic ink pigment, which dissolves in the fountain solution and causes it to be tinted. 3) The discoloration of dyed pulp and paper due to the removal of color by liquid, thereby making it susceptible to staining other materials it contacts. Blinding: A condition of the plate where the image has lost its ability to accept and/or transfer ink in offset lithography. Bond paper: Originally referred to paper used for printing bonds and other certificates, but now a generic term applied to business papers. Bristols: A solid or laminated paper that has a thickness of .006″ or more. Bristols are used for printing documents, brochures, promotional materials, envelopes, paperback book covers, file folders, tags, etc. Brush finish: A paper that is run under stiff brushes, after coating, to give a high finish. C1S: Paper that has been “coated one side”; label paper. C2S: Paper that has been “coated two sides”; coated paper for text, publication, or commercial printing. Calendering: Part of the paper manufacturing process where the paper passes between polished metal rolls. This increases the paper’s smoothness and provides a uniform thickness. Caliper: The thickness of a sheet of paper measured under specified conditions, generally expressed as one-thousands of an inch (0.001″), 11 mils or points; measured with instrument called a micrometer or caliper. Camera-ready copy: As the name implies, this is copy to be printed, which is ready to be photographed without further alteration. Coated paper: Paper that has been coated with a material to provide printing ink holdout, smoothness and levelness. Cockle or cockling: A surface that is “puckered” or with a rippling effect, intentionally obtained by air drying under minimum tension; simulates hand made, air dried paper; as a cockle finish, is a desirable effect. As an unwanted, localized surface roughness or puckering, cockle is considered a defect. Collating: The interleaving or collecting of flat sheets, signatures, or webs (business forms) in the proper sequence before binding, crimping/fastening/gluing, or edge padding; also called “gathering” when dealing with signatures. Color: Coating mixture, either white or colored. Color down: Refers to the sequence of applying printing inks to the paper, e.g. the magenta could be the 2nd “color down” in a “four-color process” job. Color separation: The process of separating full color originals into the primary printing colors; see “three-color and four-color process”; can be accomplished either photographically or electronically. Color sequence: The order or sequence in which various colors of inks are printed; also called laydown sequence. In multi-color printing, the trapping of each color down depends upon the lower tack of each successive color, e.g. jelly applied to peanut butter, not peanut butter applied to jelly. Continuous forms: Business forms produced in a continuous or web format, which may be cut (see unit set forms) to individual length or perforated for easy tear to individual length, at the forms manufacturer, or during or after use. May also be used in the continuous format, in roll or fanfold/accordion form; frequently used on automatic, pin feed units. Conversion coated: Paper which is coated on one or two sides, after it is off the paper making machine. See also machine coated. Copy: The furnished material (typewritten or line work, pictures, artwork, etc.) to be used in the production of the printed job. Copy(ier)/duplicator: When used in either form as a single term, refers to a system and equipment that rely upon electrostatic reproduction principles to either generate an offset lithographic plate, or even the copies themselves, directly from the electrostatic photoreceptor. Copying: The act of producing an image on paper that is a duplication of the image on another document, such as by a photographic or xerographic process, or with carbon or carbonless papers. Cotton fiber paper: Paper made using 20% or more cellulose fiber derived from sources of cotton, e.g. garment clippings, cotton linters (short fibers that adhere to cotton seeds) or waste and originally “rags” – therefore rag content paper. Cover paper: A general term applied to heavier basis weight durable printing papers, normally used for outside covers, such as on pamphlets and magazines; measured on a 20″ x 26″ basic size. Creep: In offset lithography, the forward movement (or stretch) of a printing blanket during printing. This can result in doubling. Can also apply to the movement of the packing under the plate or blanket during printing, causing excessive plate wear. Cut-size paper: Refers to any lift of paper, which is 17″ x 22″, or less in dimensions. Generally, specific to business papers which are generally cut-to-size” to 8 1/2″ x 11″, 8 1/2″ x 14″ (legal size), 11″ x 17″, or A4A size. Digital printing: Printing technology (laser printer, inkjet printer, digital press, etc.) that can produce printed sheets directly from a computer file, without going through some intermediate medium, such as a film negative, or an intermediate machine, such as a plate-making machine. Direct printing: Any printing where the ink is transferred directly from the plate to the paper; most lithographic printing is offset, i.e., a blanket is utilized to transfer the ink from the plate to the paper. Dilitho is the abbreviated term for direct lithography. Drilling: Piercing of stacks of paper in a precise manner; loose leaf notebook paper is an example of drilled paper, using a hollow point drill. Dry offset: Refers to the use of a letterpress plate or cylinder on an offset press, i.e., transfers the ink from the plate to the paper on an intermediate blanket cylinder. Sometimes called letterset. See also letterpress printing. Dull finish: Any finish lacking gloss and/or luster; generally refers to an intermediate gloss of coated papers or to printed ink films. See also gloss. Dummy: A preliminary layout or presentation to show the style, form, size or shape of a printing job. Edge bleed: Undesirable coloration at the edge of sheets caused by the action of the cutting knife; in carbonless papers, the image color development at the edges of the sheet or web from the same cutting action. Embossed: 1) A textured finish imparted to paper by means of raised or depressed engravings on steel rolls, so as to leave a visible surface design on the paper. 2) A raised image or design in the paper surface created by using male and female dies; an unprinted design created in this manner is referred to as blind embossing. Enamel: Originally designated a coated paper with a high gloss finished surface. Has come to signify any coated paper surface, regardless of gloss. Engraved printing/engraving: A form of recessed printing, as is gravure printing, where the image to be printed is etched or engraved below the non-image areas of the plate. The ink is applied to the plate and the non-image areas are then scraped or wiped clean. Gravure printing is another form of recessed printing, but the ink body and viscosity do differ. Engraved printing normally is accompanied by a slightly raised image area and a slightly recessed area on the reverse side of the paper corresponding to the printed image. Equivalent weights: Means of comparing the weights of papers that have different basic sizes and basis weights, strictly a mathematical calculation. 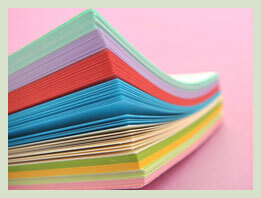 Fine papers: Types of paper, normally white, used for printing and writing; also called white paper. This term is usually used in contrast to coarse/industrial and/or packaging papers. Finish: 1) To finish paper is a term used to describe the converting operations in a paper making or printing plant, to prepare the product in a form suitable for the next customer. 2) The finish of a sheet of paper refers to the condition of its surface; a highly finished surface is one that is hard and smooth, while a low finish is one that is relatively rough and “toothy”. Flexographic printing: A form of relief printing; formerly called aniline printing. A special kind of letterpress printing, using synthetic or rubber relief plates, special inks, presses and procedures. Finds wide use and application in the printing of packaging materials and in decorating sanitary tissue products. Folio: Refers to a sheet of paper, sized 17″ X 22″ and larger; can also mean the page number of a book. Form: Any document for the recording of variable information, whether in a variable or standardized format. The form itself can be of a single sheet of paper, or multi-ply (for copies) construction. See also continuous forms and unit set forms. Forms bond: Generally a light weight, dense bond paper used for single or multi-ply output of variable information, in a standardized format; a business paper, measured on the bond basis of a 17″ X 22″-500 ream. Four-color process: The printing of a full color picture or drawing by the use of four separate process printing inks: yellow, magenta, cyan and black. See also three-color process. Free: A sheet of paper that is “free” of groundwood, though a small percentage of groundwood from mill broke contamination is tolerated; contains no groundwood. Graphic arts: Media that utilizes graphic images. Gloss: The “shininess” (glare) reflected from a surface; in paper measurement, it is the specular reflection of light, incident and reflected at a 15 degree angle from a surface, as compared to a polished plate of black glass; papers can range in finish from matte to satin or dull to glossy. Grain direction: The direction of orientation/alignment of cellulose fibers in a sheet or web of paper, resulting from the flow of fibers in a water suspension, during the paper making process; the direction of paper parallel to its forward movement on the paper machine; also called machine direction, with the orientation perpendicular or at right angles being called cross direction. Grain long: A sheet of paper where the grain direction is in the long dimension; an 8 1/2″ x 11, sheet of paper is grain long, if the grain direction is parallel to the 11″ dimension. Grain short: A sheet of paper where the grain direction is in the short dimension; an 11″ x 8 1/2″ sheet of paper is grain short, if the grain direction is parallel to the 8 1/2″ dimension. Grainy: Rough paper surface or finish, generally due to shrinkage, particularly at the edges of the web coming off the paper machine. Gravure printing: A form of recessed printing, as is engraving. The printing method where the very fluid ink is applied to the plate or plate cylinder and is actually carried in small microscopic cells, recessed into the plate. Used for long run printing applications, due to plate or cylinder costs, but long plate life; since run on rotary presses, called rotogravure. Engraved printing is based on the same principle, using larger recessed areas (as opposed to microscopic cells) and more viscous inks. Groundwood: Wood derived pulp, obtained by mechanical means and containing all the tree’s lignin type materials; carefully cleaned and debarked logs were originally pressed against the face of a rapidly revolving grindstone. The abrasive action tore the fibers from their setting in the wood. Groundwood is one type of mechanical pulp, but the term is often used synonymously with mechanical pulp. Groundwood papers: Term applied to papers containing a substantial proportion of ground-wood or mechanical pulp. GSM: Grams per square meter is the metric standard for paper weight. GSM calculates the actual weight of a square meter of that particular paper. Hardwood: Source of “shorter” cellulose fibers for paper making, as extracted from deciduous or leaf bearing trees. Hickeys: When foreign material sticks to the printing press blanket or plate in an image area, it interferes with the transfer of ink to or from the blanket surface. The printed imperfection created can appear as a hickey (a white area around a dark center); can be caused by dirt on or around the press, dried ink skin, paper or coating particles, etc. Impression: The pressure (see back pressure) or the print left by the press plate or blanket when it comes into contact with the paper. Ink jet printing: Also jet printing; pressureless and plateless forms of printing, generally where a variable image is generated from an electronic media or computer. The digitized information generating the image “triggers” the squirting or deflection of a very fluid liquid ink through one or more nozzles onto the paper surface: can be likened to graffiti spray can painting. Junior carton: A carton package of 5 to 10 reams of cut-size paper. Kraft: Also known as the sulfate process; a process and the product resulting from the pulping of wood, using a sodium hydroxide (alkaline) and sodium sulfide solution, under conditions of high temperature and pressure; a “strong” pulp. Kraft is the most widely used wood, chemical pulping process; see soda for the less widely used alternative alkaline pulping process. Kraft also refers to the strong brown paper used for packaging, like brown grocery bags. Laser printers: Electrostatic/Xerographic printers using a laser as the light source activated by an electronic media, rather than by optical means using reflected light from an original, as used in copiers to remove charges from the photoreceptor in the non-image areas. Laid pattern/paper: A watermark pattern in paper resulting in parallel lines in both the machine and cross directions of the web of paper. Layout: This is an artist’s conception (the master plan or “blueprint”) of the finished printed job. Layouts can be very rough, semi-comprehensive, or so comprehensive that nothing is left to the imagination. Ledger paper: A strong, smooth writing paper, originally designed for accounting records and ledgers. Measured on a bond or business papers basic size of 17″ x 22″. Length: Describes a property of printing ink that is the distance a finger and thumb can be pulled apart while maintaining an unbroken “thread” of ink between the two; as such, inks can be described as “short” or “long”. Length is related to both viscosity and tack, as a fluid or body property of ink. Letterpress printing: A form of relief printing. The printing method where ink is applied on all raised areas on the plate; the non-image or background area is cut away or removed, i.e., relieved. Can be likened to a “rubber stamp”, though the plate can be made of wood, metal, or other non-flexible material. Dry offset is really letterpress or relief printing, where the plate is a flexible synthetic material, with relief features, but can be run on an offset press (using no fountain solution). Linen finish: An embossed finish to simulate the pattern originally obtained by pressing paper between sheets of linen cloth. M: Abbreviation for a quantity of 1000. See also M weight. M weight: Is defined as the weight in pounds of 1000 sheets of paper of a given basis weight and size (dimensions); M is the Roman numeral for 1000. MICR: Magnetic Ink Character Recognition/Reading; magnetic inks printed on business documents, like checks, so as to be easily readable by the data processing machines through which the forms are run. Matte finish: The non-glossy appearance resulting from being an uncoated sheet of paper, or from coating without super calendering; the least glossy paper surfaces available. See also gloss. Micrometer: A device for accurately measuring the thickness (caliper) of paper. Multi-color press: A printing press that can print two or more colors on paper in one pass through the press. Offset lithography: Offset printing has become the commonly used name for this type of planographic printing; also called lithographic or stone printing. The method of printing using a plate in a single plane, where the non-image area is distinguished from the image area by creating water receptive and non-water receptive areas on the plate. Today, this is generally accomplished on metal surfaces, by either light sensitive coatings or electronic methods. Offset papers: Coated or uncoated papers. See also book papers. Offset printing: Also known as indirect printing. The method by which the printing plate is removed from the point of transfer of the printing ink to the paper to be printed, generally by means of a resilient blanket or roll; the resilient blanket or roll actually makes the impression on the paper, thus “offsets” the ink. Unless stated otherwise, can also be specific to the offset lithography or planographic printing process, using a resilient blanket to minimize wear on the plate by the paper being printed. Opacity: The characteristic of paper to block the transmission of light, or the ability to provide (low opacity, like tracing paper) or prevent (high opacity) “show through” of dark printing; the human eye is good at comparing this property, but it can be measured by instrument and is expressed as a percentage of the light that can not pass through the sheet of paper, e.g. a 98% opacity means that 98% of the light can not pass through the sheet and is absorbed in or reflected from the incident surface. Overruns: A quantity of paper made in excess of the amount ordered; trade practices permit a certain tolerance for overruns and underruns, with the percentage usually dependent upon the size of the order. Also, in printing, copies printed in excess of the quantity ordered. PMS color: An abbreviation for “Pantone Matching System”; an ink color system containing about 500 color swatches, each of which is identified by a color number and a formula for the ink. Padding compound: Also called edge padding glue or adhesive; A liquid adhesive mixture which when brushed or sprayed onto the side of a pile of paper adheres the sheets together along one edge, thus forming a pad. Paper: A relatively homogeneous matting of primarily cellulose fibers that are formed from a water suspension on the paper machine wire and bound together by entanglement of the fibers and by bonding agents and subsequently dried. Paper plates: A plate for an offset duplicating printing press (offset lithography) made of paper: can be called a paper master or master. Papeterie: A wide variety of writing papers used for personal correspondence and greeting cards, with good sizing for pen and ink, with good opacity arid stiffness, and that fold well. Parchment: Originally a writing surface made from animal skins; today made from cellulose fiber paper by dipping unsized stock in sulfuric acid, to simulate the appearance and feel of genuine parchment; called “vegetable parchment” if made from cellulose fiber paper. Perfect/perfecting press: The terms apply to printing both sides of the paper in the same pass on the printing press. Also to print on the back of a sheet already printed on one side. Printing can be on opposite sides, either blanket-to-blanket or sequentially. Perforate: Punching a series of holes or slits in a line in the paper, to weaken it so tearing will occur easily along that line. Also the making of slits in paper during folding, at the fold, to prevent wrinkles and to allow air to escape. Perfs: The actual holes or slots created during perforating. Photocopier: A machine that makes paper copies of documents and other visual images quickly and efficiently. The photocopier is also known as electrostatic copier, copy machine and copier. Plate: Depending on the printing process, the means by which the image area is separated from the non-image area; the image carrier. Primary colors: The additive primary colors are the three major wavelengths of light in the visible spectrum: red, green and blue, and are used in applications such as the cathode ray tube of a color television set. The subtractive primary colors are used when dealing with reflected light, such as from a full color printed piece, and are yellow, magenta and cyan. These are the three colors of ink used in process printing. In paper making, red, yellow and blue are the primary colors in the dyeing of paper, any two of which can be mixed together to obtain secondary colors and hues (green, orange and violet). Printing: The act of producing an image on a page from a machine designed for that purpose, such as a printing press or a computer printer like a laser or ink jet. Process printing: The printing from two or more halftone plates to produce intermediate shades, hues and tonal values. See also three-color process and four-color process. Proofs: Samples of copy and/or layout made at various stages of production of a printing job. Rag content paper: See cotton fiber paper. Ream: Sheet count of paper (500 sheets for most fine papers). See also basis weight. Ream weight: The amount that one ream of a particular paper weighs. Recycle: To reuse or to use over and over. See also de-inking. Register: 1) Of paper: a type of bond paper for multi-ply form use; i.e. register bond. 2) Of printing: when a design or form is printed in parts or steps, as in multiple colors, it is essential that all parts or inks down match exactly. When they do, they are “in register” or in registration; otherwise, they are “out of register”. See also hairline register and commercial register. Register marks: Fine lines crossing at right angles and placed on original copy before color separation. Used for positioning images, registering colors, accurate cutting, etc. Runnability: Paper properties that effect the ability of the paper to run on coating, converting, or printing equipment. Safety paper: A treated paper which when writing or printing on the paper is altered, the alteration attempt will leave a noticeable smudge, discoloration, or other evidence of change. This type of paper might be used for making checks or other documents to discourage such alterations. Satin finish: A finish lacking gloss, generally intermediate to a matte finish and a dull finish. See also gloss. Score: The process and the resulting line mechanically impressed into a heavy sheet of paper or board, to pre-stress the fold line and facilitate folding or improve the appearance of the fold. Most effectively done with the grain of the paper and is absolutely necessary with heavier basis weight paper. Sheet-fed printing: A printing process, where the paper is processed as sheets, as opposed to processing from a web (roll/ribbon). Ink-drying mechanisms can differ between the sheet-fed and web-fed offset lithography printing processes. Smear: The spreading of ink, usually due to abrasion or rubbing of freshly (not yet set) printed ink to adjacent areas of the paper surface. Smoothness: The texture of the surface of paper, also called finish. Generally determined with an instrument which measures the flow of air along the surface of a paper sample under standardized loading and air pressure conditions, i.e. the greater or faster the flow/escape of air, the less smooth the surface. Softwood: Source of “longer” cellulose fibers for paper making, as extracted from coniferous or cone bearing trees. Stiffness: Property of paper to resist bending. Strength: The strength of a sheet of paper is dependent primarily upon the nature and amount of fiber used to make the paper; the test to measure strength is dependent upon the characteristic to be measured and can include such properties or measurements as surface strength, burst, tear, tensile, or other. Supercalendering: The calendering method using alternate steel/metal and resilient (filled) rolls, generally to obtain various levels of gloss. See also calendering. TAPPI: Abbreviation for “Technical Association of the Pulp and Paper Industry”; TAPPI standard conditions (see conditioning) refer to standard conditions of temperature and humidity for most paper tests. Tensile: Strength property, measured as the force required to “pull” a paper sheet of specified dimensions, to failure; can also be expressed as “breaking length”- usually meters of length required for a web to be hung and break as a result of its own weight (gravity). Thermography: Also known as “raised printing” or by the trade named unit “Virkotype”; this process is used in conjunction with a printing unit (letterpress or offset lithography) with slow drying inks. Immediately after printing the paper is dusted with a powdered compound and the excess which does not adhere to the wet ink film is removed. The ink and powder are then fused and swollen above the level of the paper, by elevated temperature/heaters. This imparts an embossed or engraved appearance and feel. Three-color process: The printing of a full color picture or drawing by the use of only three separate colors: yellow, magenta and cyan. These are also known as process yellow, process red and process blue. See also four-color process. Toner: The “ink” of electrostatic copying/printing, defining the image area; usually consists of a magnetic ingredient to be attracted to the charged area on the photoreceptor, a colorant material (black or other) and possibly an adhesive that can be melted (or “fused”) to hold the composite “ink” on the surface of the paper being printed or receiving the copy. Tooth: A term that implies a rough finish to the surface of a sheet of paper. Trapping: The term used to describe the acceptance of transfer of an ink by the surface being printed. Wet trapping refers to the acceptance of an ink film by a previously printed wet ink surface; dry trapping is the acceptance by the dry paper or printed ink film surface. See also color sequence and tack. Trim: 1) Indicates the maximum width of finished paper, which can be made on a particular machine. 2) To remove from the edges of a sheet or roll, excess or unneeded paper. 3) The excess of paper allowed around a printed piece for bleed and/or handling and later trimming. Trim marks: In printing, marks placed on the copy to indicate the edge of the page or sheet and where to cut or trim. Trimmed size: The final size of a printed piece after all bleeds and folds have been cut off. Vellum finish: A full, toothy, relatively rough finish surface of uncoated text or book papers; generally intermediate in smoothness to an antique (very rough) finish and a regular or smooth finish. Web: A continuous ribbon of paper, as from an unwinding roll. Web offset: A lithographic printing press where the paper is fed from a roll as a web (continuous ribbon), as opposed to sheets. Paper requirements and ink drying mechanisms may differ between the two offset printing processes. Web press: A printing press that runs webs, regardless of printing method. Wove: Absence of a laid pattern.